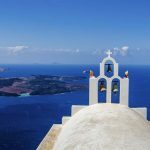 In Naxos, the largest island in the Cyclades, you’ll easily find some of the most cosmopolitan beaches of the Aegean; however, the island is also home to some of tropical ones with crystal blue waters, golden sand dunes and cedar trees, and thick pebbles. Some are inaccessible and isolated, others easily accessible, yet untouched by mass tourism. Ready to swim and relax in 15 + 1 virgin desert beaches away from the crowds? 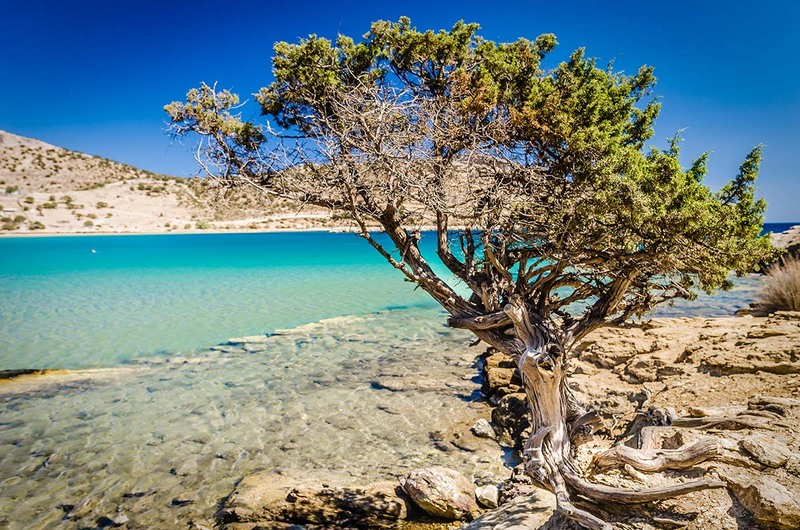 The Hawaii of the Cyclades is hidden behind a small cedar tree forest just before Aliko, surrounded by rocks and white sand dunes and resembles the cinematic Blue Lagoon. This unspoiled beach of Naxos is ideal for couples, nature lovers and nudists. To dive into the turquoise tropical waters and to walk along the sandy beach, you must carefully descend on a steep rocky path. The idyllic scenery is bound to keep you in desolate Hawaii until sunset, so get the necessary supplies (water, food, etc.) and enjoy the view. It is about 13 miles from Naxos Town. It is not a beach but a peninsula with successive coves overlooking southern Naxos. Below the protected cedar forest of Aliko, there are pristine beaches with turquoise crystal clear waters, ideal for those who want to avoid crowds and noise. These are unorganized beaches, dusted with sugar sand, but their deep blue bottom has many rocks. Aliko has an exotic character, sand dunes, a small chapel on the edge and a view that reaches to Iraklia and Ios. Although relatively isolated, it is easily accessible via an asphalt road and is 12 miles away from Naxos Town. An open bay located between Aliko and Kastraki, on the southwest of Naxos (10 miles from Chora). Those arriving at the huge sandy beach of Glyfada can’t get enough of the crystal clear emerald sea and strolls on the golden sand. The beach is also ideal for water sports. The two-mile long beach is one of the longest ones in Naxos, ideal for relaxing and meditating on the golden sand, sunbathing under the bright Cycladic sun and diving in the cool blue-green waters. The scene of this sea oasis is complemented by the cedars on the blond dunes and the rocks that naturally make ideal nudist bays. 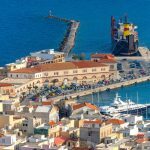 It is close to the beach of Mikri Vigla and is 9 miles away from Naxos Town. 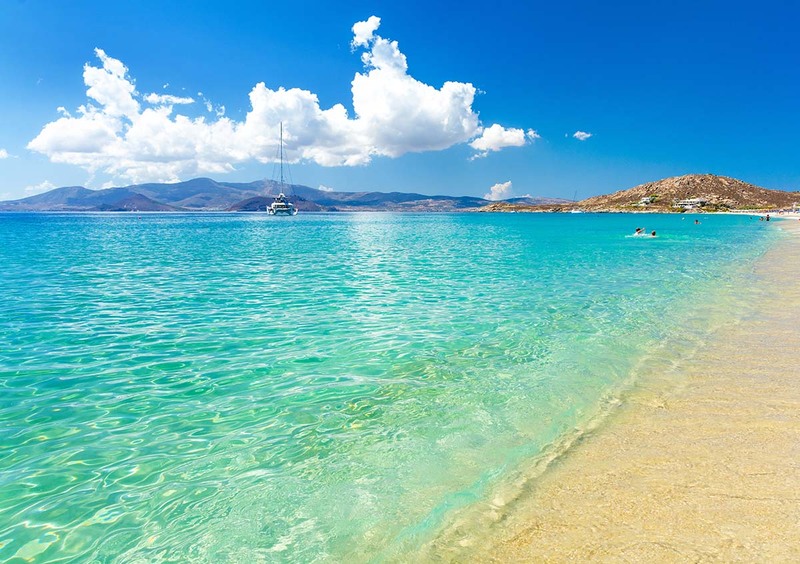 Its name means ‘virgin’ and describes perfectly this pristine beach with the golden sand, crystal clear waters and a cedar forest in its background, 10 miles southwest of Naxos Town. Almost half a mile and particularly popular among the fans of kite surfing and windsurfing, as the winds blowing in the area are ideal for sea sports. A rocky formation separates the closed cove of extreme sports from the nearby organized beach of Mikri Vigla. On the southern side of the Aliko peninsula, there is an endless beach that expands all the way to Kastraki. Sahara is a non-organised beach with sugary sand and exotic blue-green sea. Pirgaki beach takes its name from the hill that rises above it, which used to be a watchtower for pirate ships. 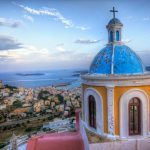 An extremely sandy beach with cedar trees, bushes, exotic green waters that are deepening fast, views to Iraklia and Ios, but also absolutely tranquil. Its ends with the small creeks and caves are ideal for exploration and snorkeling. In the area there are taverns and rooms to let. 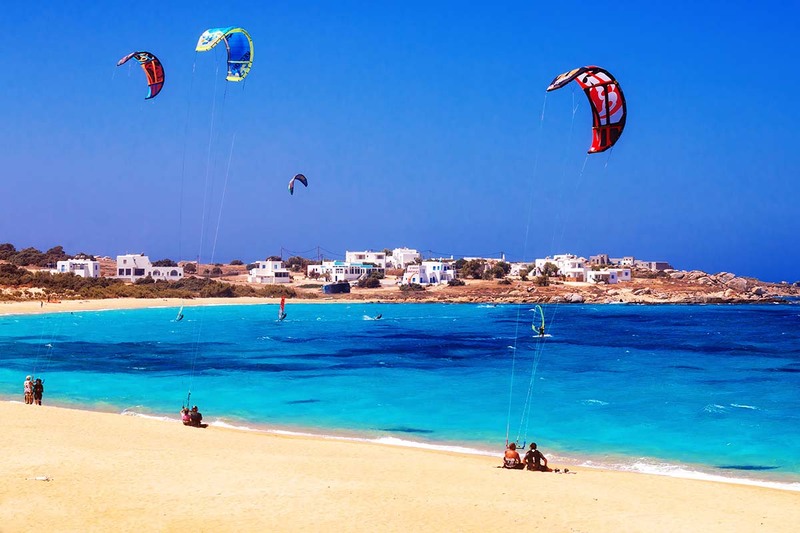 Pirgaki is located on the southwest coast of Naxos next to Aliko and 12 miles away from Chora. The scallop-edged coast of Orkos is made up from adjacent bays between Plaka and Mikri Vigla. Rocks divide the endless white sand into small, ‘individual’-sized beaches. Ideal for those who want to escape the crowds and enjoy swimming in the crystal clear waters. Orkos is about 7 miles away from Naxos Town. A northern bay adjacent to the village of Kampos, 12 miles away from Chora. Far from the hordes of tourists, it keeps its natural beauty undisturbed and invites you to go for a dip in its warm waters, walk on the white pebbles and or take a nap under the trees. Abram Beach is ideal for windsurfing and other water sports, as the winds in August are particularly strong. In the area you will also find taverns and rooms to let. A distant virgin beach with wild beauty and clear deep waters, at the northeast of Naxos (25 miles from Chora and 5.5 miles from Koronos village). As an old port of emery, Lionas bay has black pebbles from the rare stone and rocky scenery. Not suitable during strong northern winds. 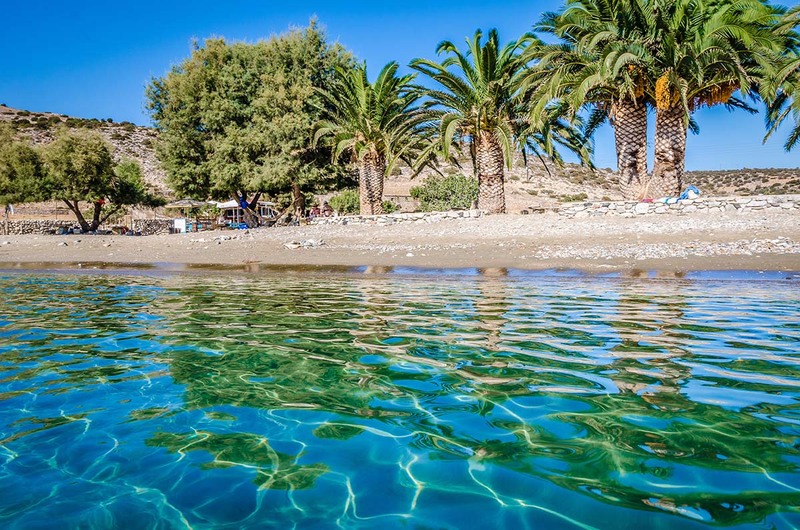 A quiet sandy beach, half a mile long, with crystal clear sea and tamarix trees, located 13 miles southwest of Naxos Town. Ideal for families with children as it has shallow waters and is not affected by August winds. The caves at the edge of the beach are ideal for snorkeling. Agiasos also has taverns for fresh fish and local specialties. About 8 miles from Moutsouna, at the end of the road, you will see the small, narrow bay of Panermos. Boats are often anchored in the secluded harbor, while holidaymakers seek relaxation away from the crowd resort. The characteristic feature of the beach is palm trees, right next to the emerald sea. 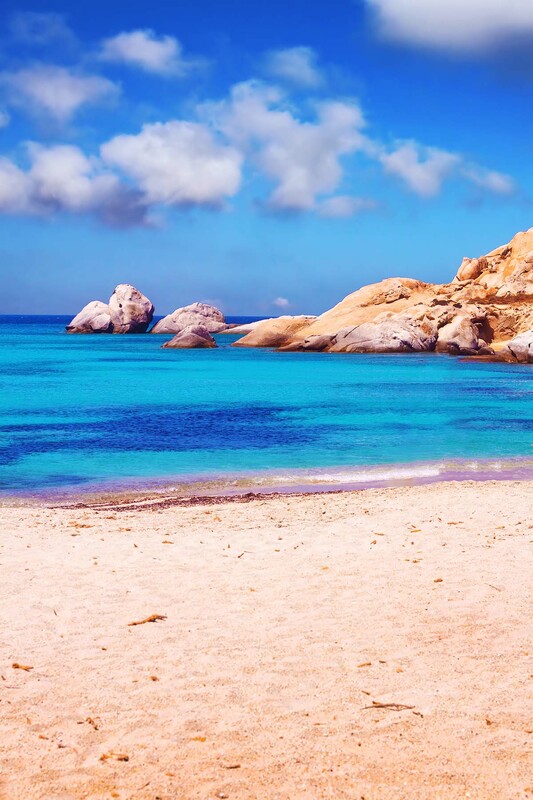 A tropical landscape with sand dunes, cedar trees, fine golden sand, turquoise crystal clear sea and a view of Koufonissia; this amazing beach is located between Panormos and Moutsouna, 7.5 miles away from Apeiranthos. It is not organized, which means you have to pack all the necessary supplies. The little bays of Kleidos are located on the southeastern coast of Naxos, in the homonymous settlement. Leaving Moutsouna, after 7.5 miles on the coastal road, you pass Kanaki and you reach the ideal spot to relax away from the cosmopolitan beaches of the island. Rocks divide the sandy beach into tranquil private ones where you can enjoy swimming. Pack a snorkel mask and explore the sea bottom. The most isolated beach of Naxos, at the southernmost tip of the island. The coast connects to the sea on the one side and a pond on the other. Access is recommended by sea with one of the daily excursion boats. 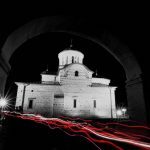 Alternatively, you will reach Kalantos from Filoti, traveling 15 miles on a hard route which includes a piece of dirt road. Pack all the necessary supplies as it is not organized. 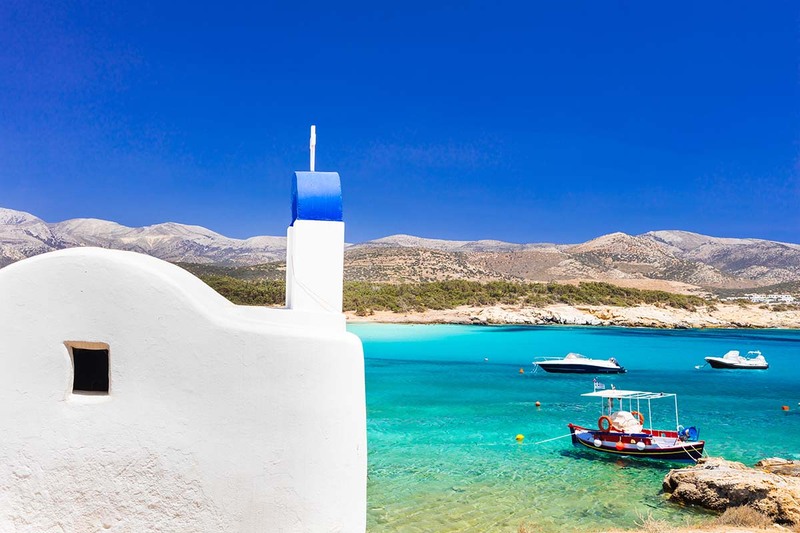 Located on the northwest side of Naxos, just a mile away from the village of Eggares and 7 miles from Chora, this non-organized beach embraces the wind, white sand and clear blue waters. The waves make it ideal for windsurfing lover. The strong sea currents mean that constant attention is required, especially if you are travelling with children.